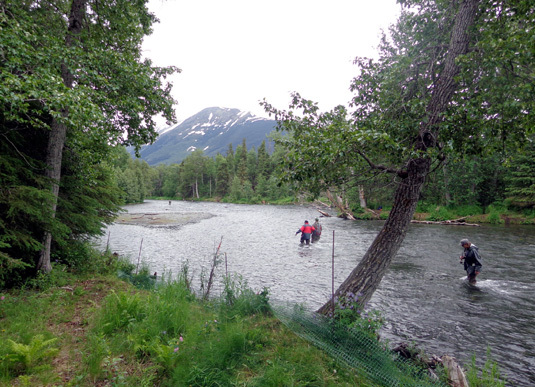 "Probably the most popular attraction on the Kenai Peninsula is the fishing . . .
there if their chances of catching fish weren't extremely good." We're certainly getting an education in salmon fishing this week! 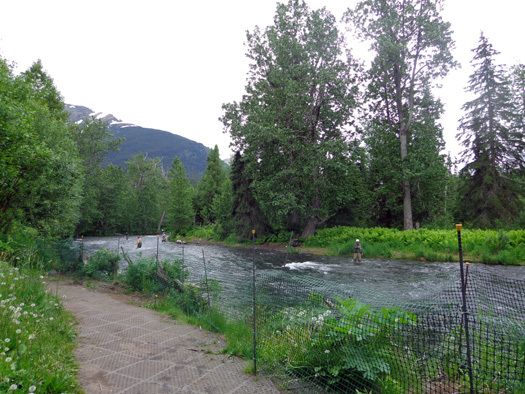 We've read about this hugely popular sport in our Alaskan guide books, promotional literature, and interpretive signs various places but now we're completely immersed in the fishing culture at Salmon Central. 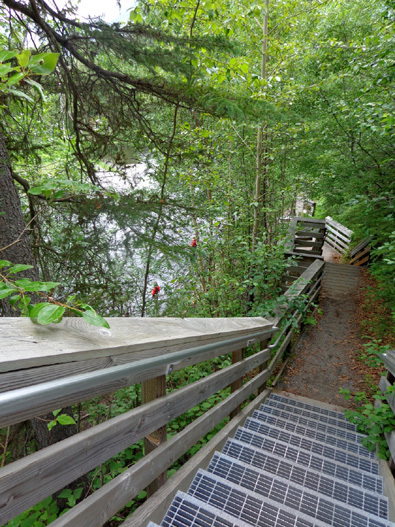 There is a very long history of salmon fishing in this area, which you can verify at the K�beq interpretive site across the road from the Russian River Campground entrance. 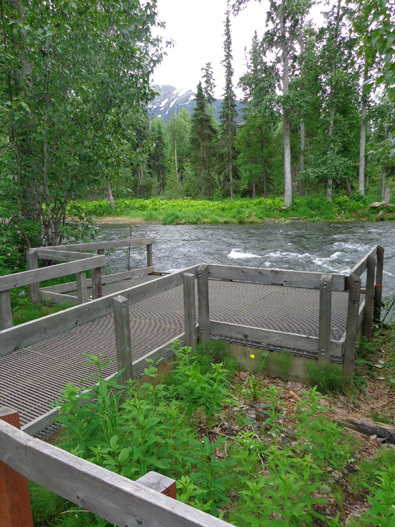 This location near the confluence of the Kenai and Russian Rivers has been used for approximately 11,000 years by Native Alaskans to subsistence fish for salmon. 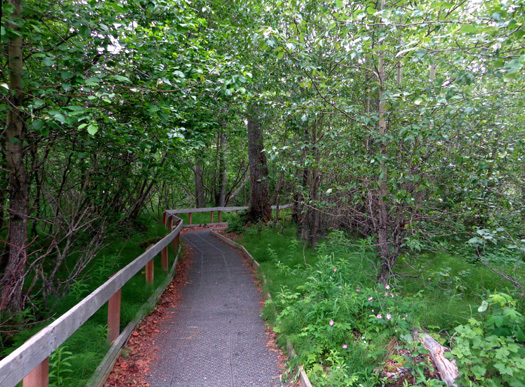 The K'beq heritage site is part of the Seward Ranger District of the Chugach National Forest but is operated by the Kenaitze Indian tribe. They offer free cultural tours to visitors. I'm sure it's more fun to be out in the river fly-fishing and watching out for the bears who want the same salmon you're angling for . 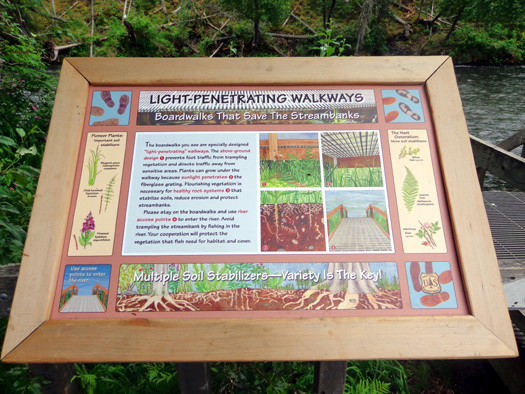 . . but I can tell you that it's also fun to learn more about the sport by walking through the lush rainforest watching the action and reading all of the interpretive panels along the boardwalk and dirt trails. That's the focus of this entry. 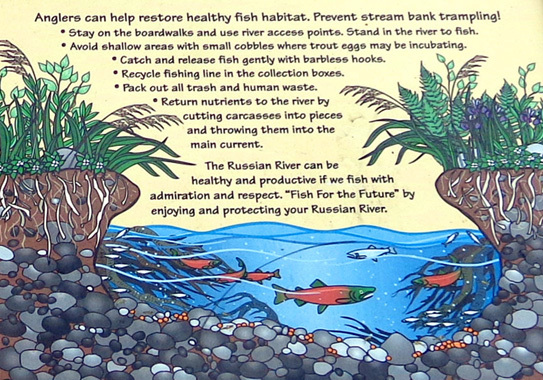 I'll show you two pages of photos of the "fish walk" along the Russian River from two hikes I took with Cody. After we got settled into our campsite yesterday Jim wanted to go for a walk. 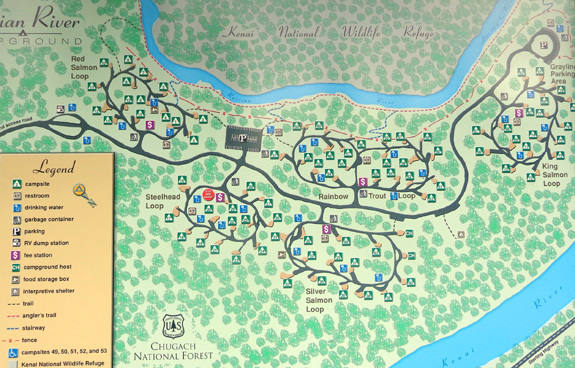 Here's a repeat of the campground map to show its proximity to the Russian River (at the top of the map section) and the Kenai River. The two rivers converge a couple miles north of the campground. 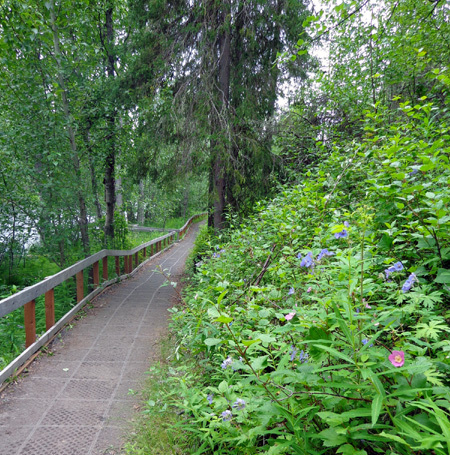 There is a trail along the southeast bank of the river for about 2� miles with approximately 35 access points to the water. 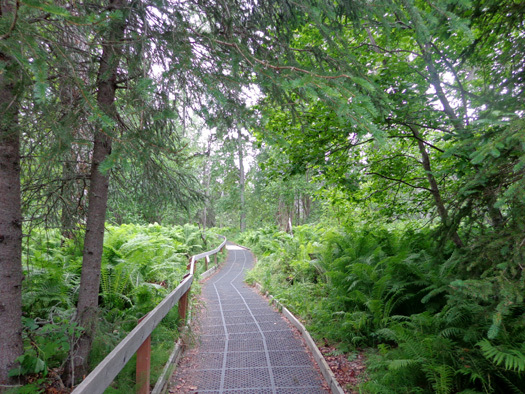 The trail is a rainforest wonderland! I love it. 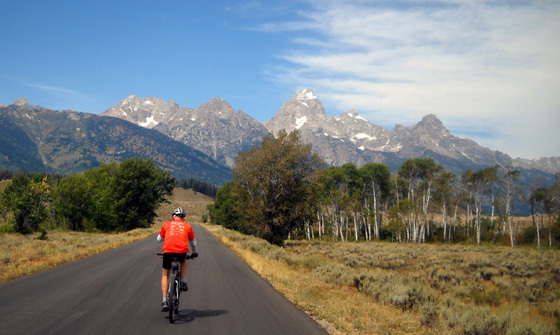 It reminds me of some places we've visited in Oregon. 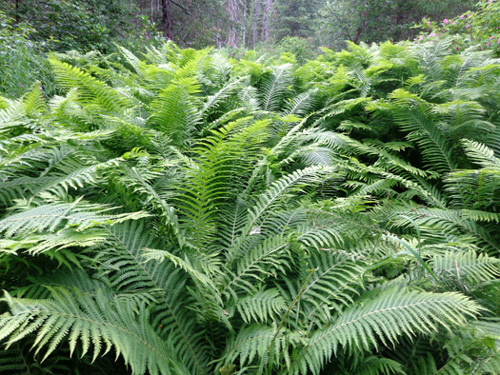 There are huge cottonwood trees with eagles nesting in them, tall spruce and hemlocks, aspens, birches, willows, ostrich ferns taller than I am, shorter horsetail ferns, bluejoint grass, numerous pink wild roses and blue wild geraniums � so lush and beautiful! Because of the heavy use this river gets from anglers every summer there are serious erosion problems. The fencing discourages people from trampling the vegetation and causing further erosion of the banks. 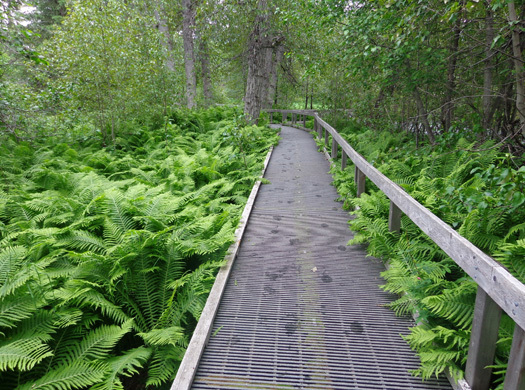 A closer look at the unique walkway; plants can grow under the path, adding stability to the river bank. 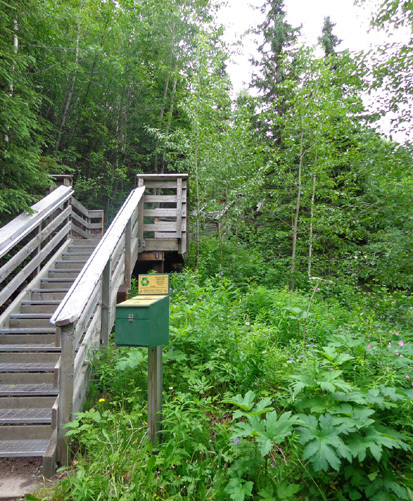 Steps and/or decks allow access to the water without damaging the soil and plants on the banks. It�s effective, attractive, and interesting. IT'S TOUGH TO BE A SALMON! There weren't a lot of folks fishing this afternoon when we were down at the river. There may have been more this morning. It's also a little early for the second run of the sockeye and there are strict limits to how many can be caught because of their limited numbers this year. 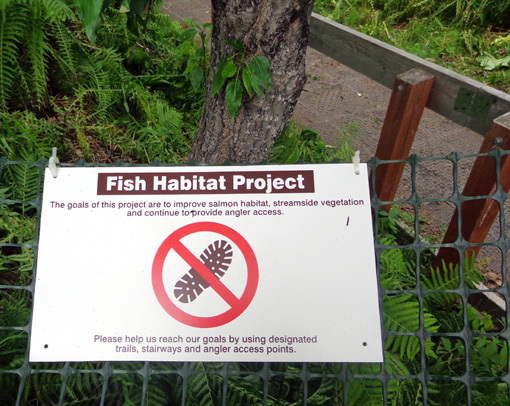 One of the interpretive signs in the area says that only about 2% of salmon make it to the Pacific Ocean, where they live for three years, and return to their spawning grounds in Alaska successfully before dying. This year many of them appear to be dying in the ocean or coming back in two years instead of three, perhaps because there isn�t enough for them to eat out there. They are smaller and either don�t produce as many eggs or don't have as good sperm as they would if they were three years old. This has happened before and scientists aren't always able to explain what's wrong. 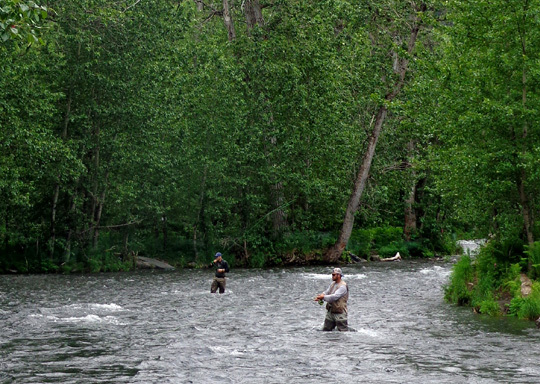 There are a number of other rules and regulations that control fishing in the Russian River -- where fishing is allowed, the types of salmon and other fish (rainbow trout, Dolly Varden) that can be caught at particular times and in what manner (fly fishing only for red salmon right now, e.g. 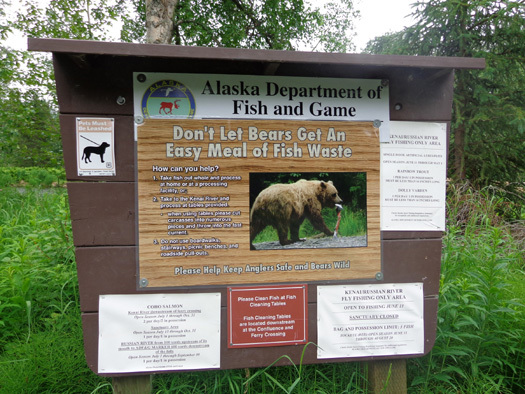 ), precautions to protect oneself from bears that also want the fish, and other regulations to ensure the safety of anglers and the preservation of enough salmon to spawn. 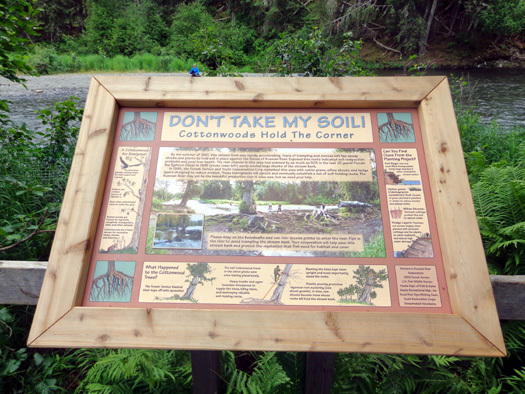 Another sign explains that thousands of early red (sockeye) salmon hold up in the sanctuary area to rest and gather strength for the run upstream to their spawning grounds. They are extremely vulnerable to anglers at this time. 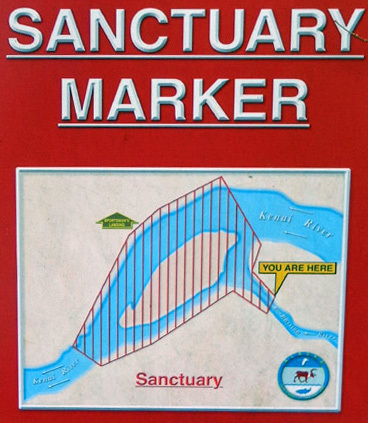 Before the sanctuary area can be opened to fishing, a satisfactory escapement level must be achieved at the counting weir located above Russian River Falls. We saw one of the weirs at the bottom of the falls later in the day; I'll show that to you in the next entry -- along with a mama grizzly and her two cubs who were fishing there! We didn't see the weir at the top of the falls.